Chicago police arrested two armed men this morning, following a car chase that began in Chicago and ended in a foot chase in an Oak Park neighborhood. The names of the two men arrested have yet been released. Chicago police spokesman Howard Ludwig said the incident began in Chicago at around 9:18 a.m. and ended shortly after, when the two men were taken into custody in Oak Park. They were in possession of an AK-47-style rifle and a handgun with an extended clip magazine, Ludwig said. 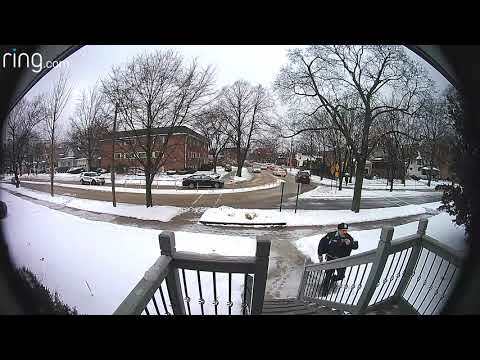 Video footage of the chase was posted on a website for Neighbors App, a neighborhood watch application that makes home-security surveillance video available to the public. Ludwig tells Wednesday Journal that police spotted the stolen vehicle near South Pulaski Road and West Gladys Avenue. They attempted to pull the men over, but the two fled in the vehicle southbound on Pulaski, Ludwig said. Oak Park police report that gun shots were reported in Chicago and a vehicle matching the description of the vehicle in question was spotted in Oak Park. The police chase continued into Oak Park, where the vehicle struck a fixed object after colliding with police vehicles, Ludwig said. The two men fled on foot into the neighborhood near the corner of Jackson Boulevard and South Maple Avenue and were captured shortly thereafter, according to Oak Park police. Ludwig said the two men have not yet been charged to his knowledge. Their names are expected to be released later today, he said. Ludwig said police are collecting evidence for the State's Attorney General's Office and are expected to file charges against the two men later today. Oak Park Police Commander Roger Grivetti said in a telephone interview that the two men were able to evade capture in the car chase in Chicago, but Oak Park police spotted the vehicle and, along with Chicago police, continued pursuit of the two men in Oak Park. One of the offenders was apprehended in Forest Park by Forest Park PD. Happy that OPPD and FPPD were all unharmed during the incident. Kim Foxx is too busy with whatever social justice cause du jour to seriously prosecute any of these cases. Even with a prosecution, Cook County judges will apply meaningless sentences. On our own indeed. Ramona, I agree. It is scary. But as it has been said before, the truth will set you free. And the truth is - as inconvenient as it may be - we (me, you, and the rest of us) are on our own here in OP. 1. New Years Eve...woman carjacked in her garage in Oak Park. 2. 1/22/19...3 armed masked men steal car at 1100 block of S. Taylor. 3. 1/18/2019 Car Stolen at gunpoint on 700 block of Garfield and now this. Be careful out there. No amount of laws on the books are going to stop these criminals from getting guns, that's what makes them criminals. Be aware of your surroundings and invest in a dashcam or a stickshift vehicle.